A section from a larger painting. In the garden of our old home one flower bed that was full of peonies. They had been there for many years, loved the soil and each year saw huge blossoms that were a brilliant temptation for the artists eye. 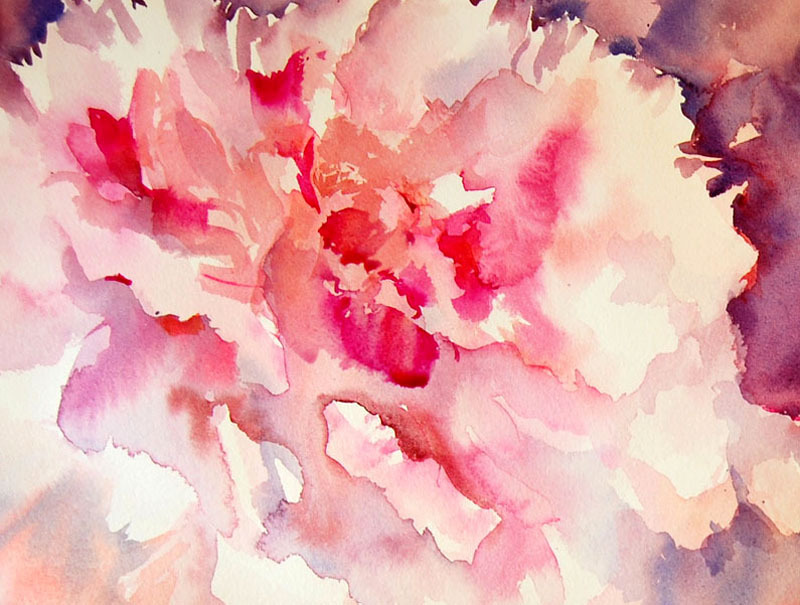 These beautiful and delicate flowers were always a delight to paint. 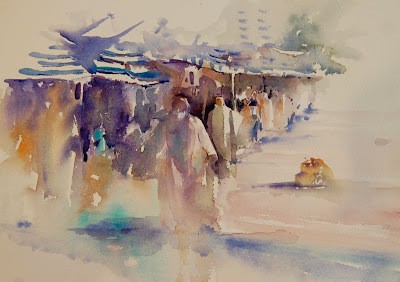 In many ways they reminded me of the instruction I received under my Chinese mentor because they had instilled in me the need to find the way to capture the essence of a subject with only a few brushstrokes. Each one as important as the other. From a collection of old images. Quiet sections in any painting are only effective if they are set next to those with more impact. Less is often more.effective than adding far too much detail. In some countries they believe it is more effective to say less rather than discuss every single detail in depth. Have you ever listened to someone talk incessantly and wished that they would just get to the point? When you work in a loose style that is exactly what you are doing.You are getting straight to the point without detracting from what is important. You are aiming to capture the subject in a simple and direct route. In my book and during my workshops I often use one word. Simplify your life and your art by placing the focus only on what is important. When we paint it is the subject and how we capture it along with the composition and colours used to bring it to life. Each day brings new challenges. If we only focus on what is important and let that flow into our art and soul life can surely only be so much better.. Placing the priority on what really needs to be done, having positive friends, doing things that make us feel good as well as bringing a smile to others. Things seem so much better when you do! Primrose Challenge: What Shades Do You use! 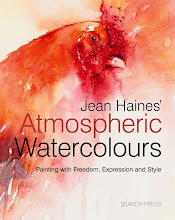 Original Watercolour by Jean Haines. Out of interest if any artists are reading this blog and have successfully found a yellow that is perfect for painting primroses would you like to share your thoughts and suggestions? I am working with a selection of shades adding a touch of cerulean blue to make a green hint. 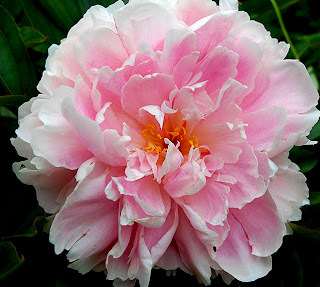 The petals are not pure yellow or lemon. It would be really interesting to see how others capture them colour wise! I have been asked who my favourite artists are which is why I am gradually sharing tributes so that I could show an insight into how I have been influenced over the years. 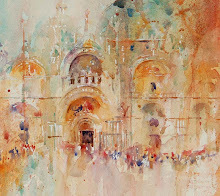 I know I am not alone in being a fan of David Howells watercolours. I first fell in love with Davids work when I lived in Dubai. He was in an exhibition at the Majilis Gallery and his colours were absolutely perfect. He caught the heady heat and atmosphere of the beautiful scenes from the Far East in a way I could only dream to do. His accuracy in detail is superb, What inspires me most is his comfident brushwork. So if you haven't come across Davids work please enjoy this link. I came home this morning to hear a message left on my answering machine. I had sent the above two Bearded Collie paintings to the breeder who my young dog Bailey came from five years ago. 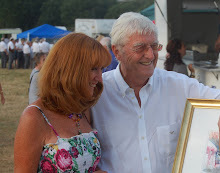 Carol Wessen came to a Private Preview of a show in Hartley Wintney last year. 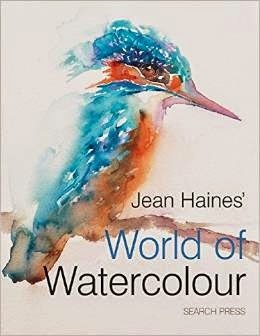 I was so thrilled at the time because Richard Sorrel the then President of the Royal Watercolour Society was another of the guest artists featuring in the exhibition. I love the colour in Richards work and found myself looking at his collection endlessly during the run of the event. 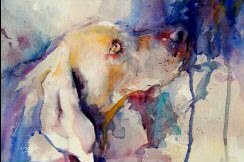 Near the entrance of the gallery was my painting of my own dog Taffy in a similar pose to the one Carols dog is in above Laying down looking up with soulful eyes. Carol would have loved to have bought the painting but it sold. Later Carol looked after Bailey for us when we moved last year. She was so kind in keeping him while the upheaval took place. But when we went to pick him up she and her wonderful husband Ed refused to accept payment of any kind. I never forgot that kind act on their part so decided to try to emulate a similar painting but this time with one of her females as the model.Carol kindly lent me some photographs and time passed by. I have been so busy with my career,writing my book and exhibitions I have never found the time to paint that special piece for her until now. 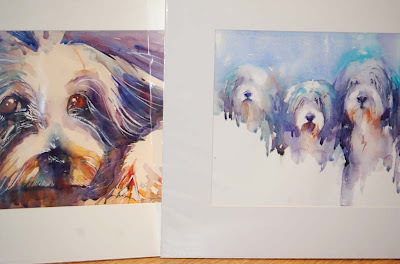 With each brushstroke I felt the love Carol holds for her dear pets. I thought of the day we picked our own pup Bailey up and how loving she and Ed were to all their dogs and new owners who take a puppy from them. I carefully and eagerly wrapped the two paintings and sent them in the post by special delivery. And waited. This morning while I was out Carol rang to say the paintings had arrived and that she was so thrilled with them.She sounded almost in tears as she thanked me. And I have to say my eyes filled up to. I am sat here thinking all the money in the world for a painting could not possibly touch this feeling. Nothing can match that message.No sale could ever make me feel so happy. Giving is such a wonderful thing to do. No matter how big or how small the gift. Kindness has its own rewards. And what you give in love will always come back to you somehow. It has been a full and busy week already and yet it is only Tuesday! I am working on new collections, preparing for workshops and working my way through a full inbox of email. I am getting some wonderful messages that really make me sit back and smile and I desperately want to meet the people behind them.The internet does bring us all so much closer together and it is really special when you think that years ago we hadn't a clue what was happening anywhere else in the world. Having said that I recieved some really wonderful messages from friends living in Dubai letting me know an artist was demonstrating there from UK. An advertisement for the event apparently showed a painting of a rose which looked similar to one of my paintings from a few years ago. I read each message with a smile and felt really touched that anyone could remember my work from that time. 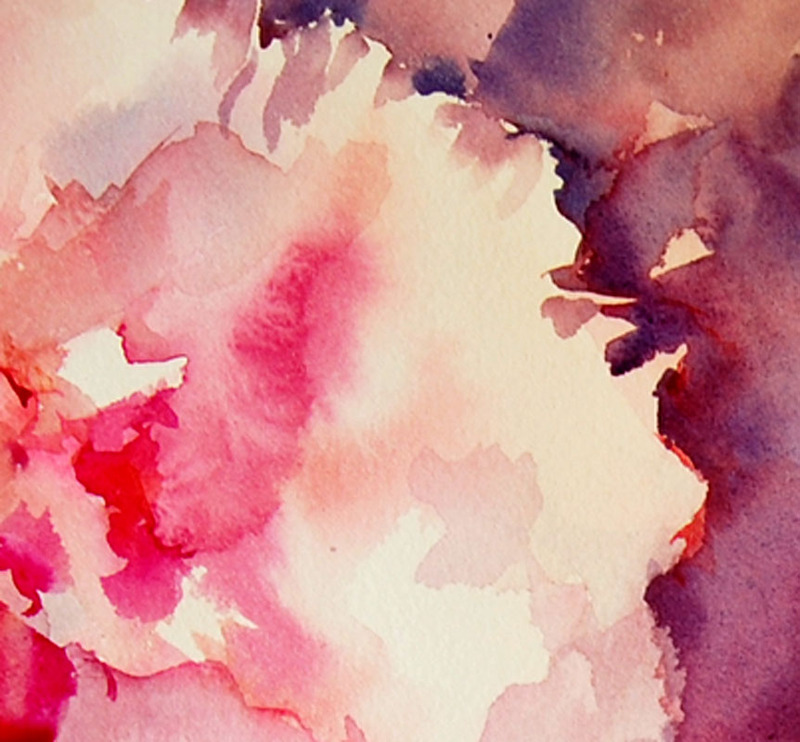 We all paint roses in so many ways. 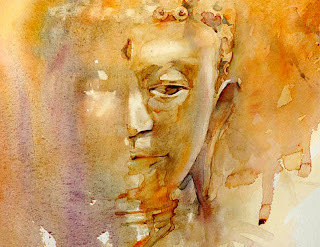 In fact we all paint every subject in so many ways with so many different interpretations. And roses are roses after all. 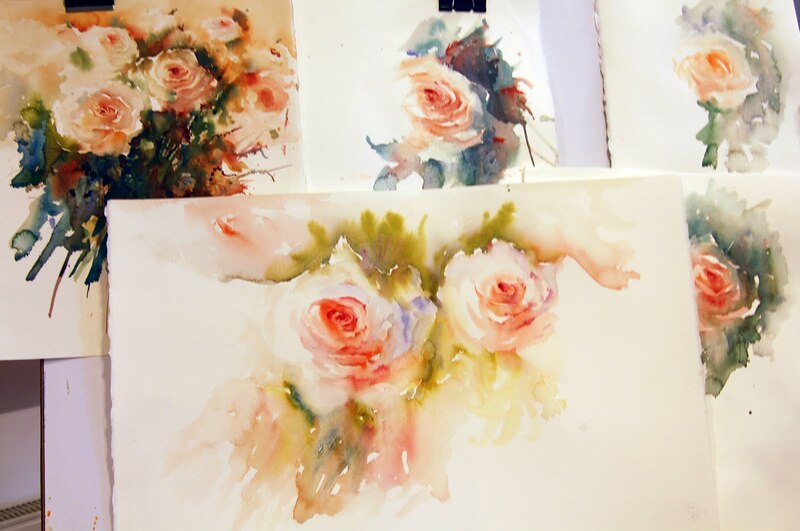 I am influenced by Madame Blanche Odin and have yet to master roses as she did in watercolour. Each year I try again to get to her level of expertise but I am still a long way off. But when I looked at the email attachments the rose in question is similar to a composition of mine but it should be. The artist has been to me on many occasions and watched me painting these roses in person. But many artists paint roses, not just me. There are several lessons to be learned from this experience. 1) The world is a very small place and no matter where you are or what you do you are observed. 2) If you are teaching it is always wise to use your own material or at least mention any artists who inspired you openly and honestly. If they have. With the internet as it is we do all have access to international artists work that once we would not have had. 3) Try to be unique when you demonstrate. 4) Keep work in advertising material to that which cannot be misinterpreted as another artists painting. Thank you very much for the emails. I am learning as I grow as an artist from those who are far more advanced in their journey than I. Another point, well worth remembering. New artists who follow in footsteps of others actually compliment their teaching skills which is why we teach in the first place. I follow previous masters and eagerly try to learn still. I hope I always will. This morning finds me preparing for next weeks workshops. I have ordered materials for each session. Often artists arrive and wish they had brought more paper so I ensure I have an extra supply at hand. 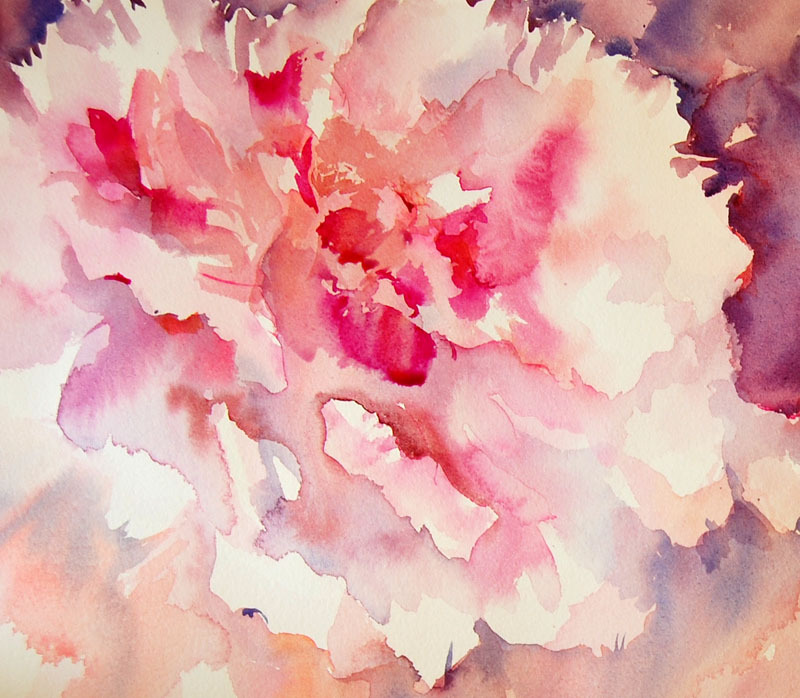 I will visit the florists to order beforehand for the floral workshop and I have been on the look out for some exciting subjects to paint from life along with putting together some interesting resource images. Every day is designed to be full of tempting new ways to cover paper with glorious colour. I have also made the bookings for meals for each day. These take place in an Inn next door to where I teach so everyone has a wonderful break mid day. I join the group and get to know everyone without a brush in their hand and this is a special time for me. I listen to funny stories and experiences of workshops that have been attended elsewhere by the artists. Some good, some bad and there is always laughter over the tale swapping! My favourite tale to share is of the so called famous German artist who held a workshop without once picking up a brush.This was in Dubai and to this day we laugh so much about it. We had no instruction at all. We were simply faced with someone stood at the front of the class telling us all how marvellous he was. And we paid handsomely for the privilege of no instruction! I look back and realise how gullible I was then. I would go anywhere for inspiration and often leave feeling disappointed. It is these experiences that have helped my own workshops evolve and become as they are today. So much planning goes on behind the scenes before each one on my part as my aim is to ensure every single person attending each day gains the most they possibly can from the experience. From years of not only teaching but also attending other artists courses I can put so much into practise when it comes running classes. Often workshop fees will go towards the hire fee of the location, the lunches and other aspects of the organization. Artists often charge depending on their experience and the professional level in their career. It is amazing how these charges can vary and it is sometimes horrifying to find what you are paying for isn't quite what you expected. So a few tips this morning if you are thinking of booking a workshop with an artist you don't know very well. Think about what you want to achieve by attending their workshop in the first place. A new style, to improve, or simply to be inspired or motivated to pick up your brush. Who do you choose and how from so many workshops on offer! 1) Firstly look at the artists work beforehand. How experienced are they and have they a style that appeals to you? What level are they at in their art journey and does the course fee reflect that? 2) Check their teaching experience. How often do they teach, how long have they taught for, do they have any qualifications in teaching? If in doubt ask if you can talk to someone who has attended their workshops before. You should receive very confident answers and this in turn should fill you with confidence to book. 3) Facility Details Ask how many artists will be in each class?. If it is a large number ask how big the room is,what are the facilities like? If the number is very small ask how many is normally the maximum number to attend in each class. 4) Gain knowledge about the artist. 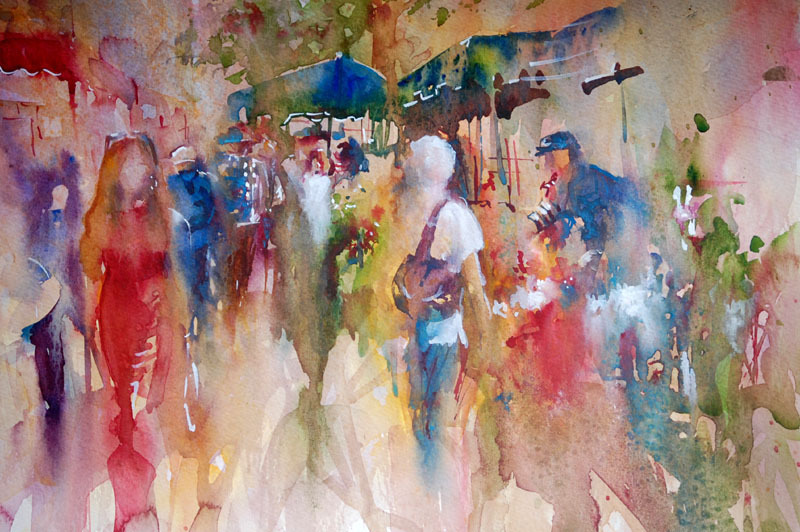 Find out if they exhibit, write or demonstrate for Art Societies. 5) Be cautious, do not on any account part with large sums of money if you know nothing about an artist! Especially if you cannot see their work beforehand or if they have very little teaching experience. This does not mean that new teachers are not worth visiting by any means. I often find someone new at holding workshops quite often has more enthusiasm than possibly some more experienced and well seasoned artists who have taught for years. Even so realistically the fee should reflect the artists experience. 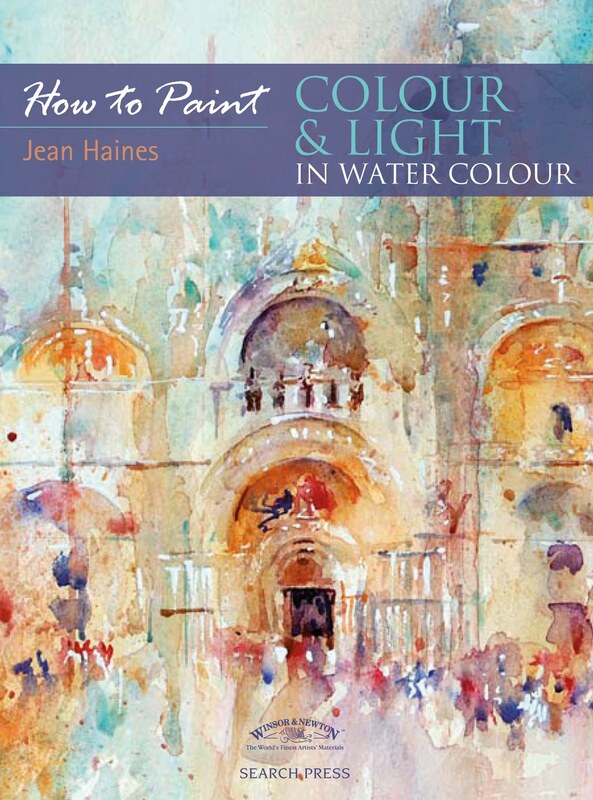 I remember living in France and seeing an advertisement for a watercolour workshop which was luckily in a nearby village. I eagerly rang to ask if I could visit before I booked a place. The advert showed a gorgeous landscape and I was thrilled to discover the artist was near me. They very reluctantly allowed me to see their location in advance. The studio was filled with very amateur paintings and alarm bells immediately rang. I then asked how many workshops the artist held annually. This was their first and they were charging a £100 a day from people who travelled from abroad, mainly UK for a painting holiday. Once there these innocent people were trapped with no refunds. It is really frightening how many artists run courses without the experience to do so and even more frightening that they charge whatever they wish. I wonder what stories I will hear over lunch next week, all good ones I hope! April sees the beginning of my Spring workshops and I am feeling that wonderful heady buzz of knowing the sessions have been looked forward to for months..Artists are coming from South Africa,Italy and France and it is going to be such a special week. Excitement builds as everyone after months of waiting finally knows the day is drawing nearer when we will all be painting together following demonstrations which I hope will inspire long after the session has passed. How wonderful to take a walk wiht my four legged family and see so many wild flowers growing in their natural habitat. It is the time of year when so many gorgeous flowers start forming glowing carpets of glorious colour in the countryside. Primroses are everywhere at the moment. For me the challenge isn't so much in capturing their shapes or the way they always seem to appear in beautiful clusters. It is in gaining the exact milky lemon shade of their petals. 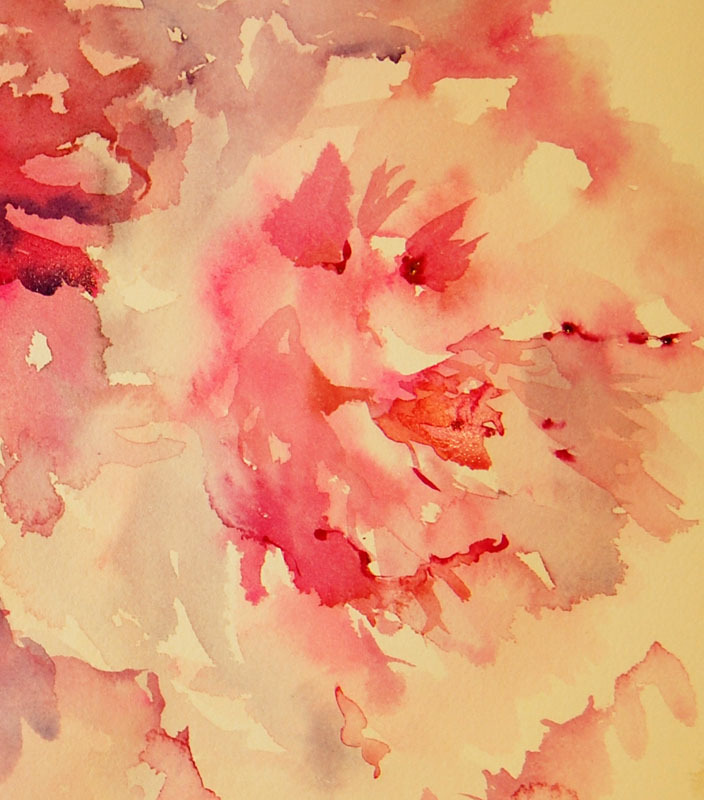 While I work I often wonder what colour other artists use to depict this sweet spring flower. A little while ago early primroses appeared in our cottage garden.They were in well protected positions under gold coloured hedging and peeping through old autumn leaves on the ground from last years fall. The difference in painting them now on location en plein air is evident in the light and freshness of my small study. I can easily see the way these flowers should look as I am painting from life. 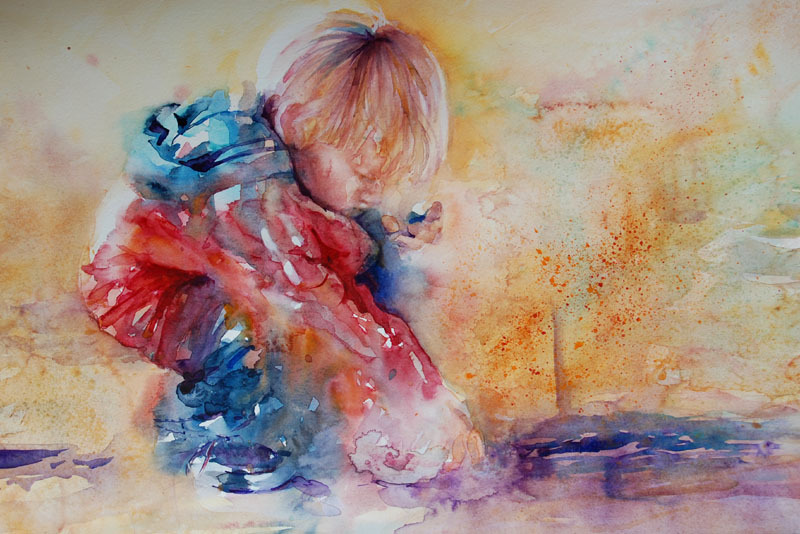 Aiming to capture this moment in time in my work with a sense of freshness and spontaneity is sheer joy as an artist. It is going to be yet another wonderful week! Today there really will be great excitement as so many Farnham Arts Society members will be turning up at the James Hockney gallery with their submissions for this years Spring Exhibition. A team of willing volunteers will man the hand in day and help hang the paintings. The judging panel will be considering which pieces are right to be included in this years event.It will be a very tiring day on the part of the volunteers who work behind the scenes to pull this off to such a high standard. Months of preparation lead to this memorable annual event. I will add more on the exhibition in the next entries on my blog but if you would like to visit the exhibition or learn more about the society you can find full details on this link. This week has flown by. It has seen me visit three galleries that show my work to deliver new paintings. I also took some of my collection to a new gallery that will open next week. I knew the owner liked my work but I was surprised to recieve a call later that same day to let me know they had already sold my paintings before they had even reached a gallery wall ! This meant a return on my part with another selection for them to show when the gallery opens. I often have new artists asking me if they are ready to sell in a gallery. To be able to turn around in this kind of situation and confirm you can bring more work in of the same standard or agree to create more in the future in similar subject themes is expected. 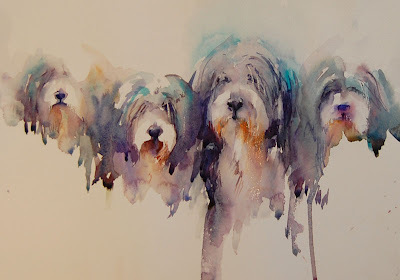 I also now have requests from two more galleries for my racing scenes and my dogs are also wanted by another.All this with three London shows to prepare for and my international workshops which take place the week after next. But this was a week for mainly Spring flower sales and I wish I had more but as I paint from my heart only a few special pieces were available. I don't wish to have hundreds of paintings just painted for the sake of it floating around in the world. Each painting has to mean something to me. I will have fallen in love with the subject and aimed to capture it in a unique style. I may paint the same subject several times but always aiming for each new painting to be more unusual than the last. Never the same because the collectors who buy my work deserve to know they own an original..
Years ago as a beginner I did used to paint the same thing over and over again especially if it sold. But I have moved on from being a new artist. I am not looking for a hundred sales. I want magic in each piece. Every painting has to hold that certain something that makes me want to keep it. I also respect the collectors who love my work enough to buy it knowing when they do the original is theirs alone. The word original is dear to me as an artist and I am sure to the collector too. A gallery must also enjoy having peace of mind knowing they are the only one to show that particular painting without a million others showing the very same piece at the same time. Maybe that is why my work is selling so well. Or maybe it is the way I paint. Or maybe it is the subects. But what matters most to me is not the selling. It is the sheer joy in picking up my brush. 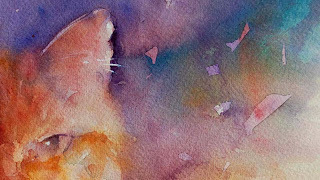 The excitement of always having something new each day to capture in watercolour and the thrill when the subject first appears in the wash.
That I hope shows in my results. Tomorrow is the hand in day for the Farnham Arts Society Annual 2010 Spring Exhibition. Members will be arriving with their work and hoping the judging panel will accept their pieces for this prestigious event. As an Arts Society Farnham boasts some incredible members. 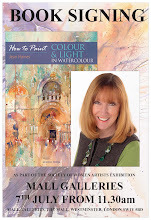 Artists who regularly exhibit in the London Mall Galleries exhibitions such as the Society for Woment Artists, The Royal Society of Painters in Watercolour and many more. Membership for the society is open to artists of all levels. However to become an exhibiting member candidates are required to submit pieces for a selection process which is held twice annually. Once accepted the exhibiting member is entitled to submit work for the societies events. This does not automatically mean they will have work accepted at the Spring Show.This simply gives you the right and entitlement to submit. The Farnham Arts Society Annual 2010 Spring Exhibition is always worth attending as it has a huge variety of art on show. The judging panel which changes each year will need to select pieces that they feel meet the standard of the society.Every artist will be deciding what to submit and by now should have their have their work prepared following the guidelines for submission. The hand in day could be a TV drama in so many ways or at least a book. Once the doors for hand in are officially open the artists arrive with their work. There will be the well seasoned professional casually walking in with their work completely relaxed as they have done this a million times before. There could be the " You are so lucky to have a painting from me in this show " character, we all know one! There will be the new exhibitor who has just gained exhibiting status where this moment has been long awaited. Their excitement is the best to witness and it is an achievement to be recognised. Sadly there will be also be the odd few who always seem to miss reading the rules even years after exhibiting. There will always without fail be those nervously taking work in hoping they will not be rejected. So two words hit me this morning. Which I am going to post about on another blog entry! It is amazing how a simple walk in a country lane can create so much inspiration. With a million things that need to be done this morning I find myself distracted casting everything aside and playing with a violet. 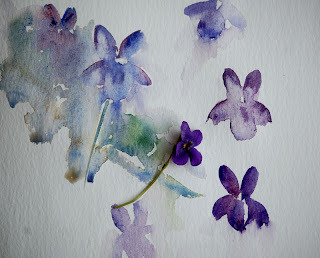 On a scrap of paper with absolutely no intention of creating a frameable painting I have simply allowed my brush to capture the essence of the tiny flower. The first challenge is to gain the exact purple shade which isn't as easy as you may think. Next I needed to decied is this a solid petal or a transparent one. If you look at my samples above the answer becomes obvious. The solid study looks more realistic. Then I choose my brushstrokes. I don't physically choose them anymore because after painting for many years I instinctively know which will suit each subject but there was a time when I never really gave this much thought. From studying in China I know where and how I place every mark is important. I can achieve so much with just one touch of the brush. My Shanghai mentor was a tiny lady who was a master in her work. I felt honoured to be able to hold her brushes yet alone use them. She taught me how to load my brush with more then one colour at a time. She taught me how one brush in any size can achieve so many effects purely by how you apply it and by how much pressure you use. The petals of the darker violet are in one stroke without my returning to the petal to add more pigment. It's a well placed and controlled action. 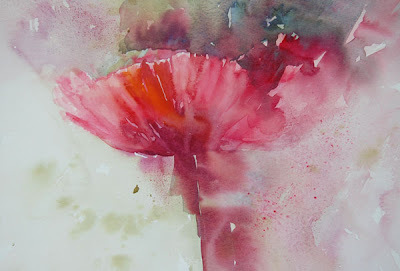 Then by turning the brush at an angle and laying it sideways on the paper I can create the larger lower middle petal of the same flower..If I lift the brush quickly I can create another effect simply by removing the brush from the paper at a certain speed. Where we start, where the brush first hits the paper and just as importantly what happens when you pick the brush up to leave the paper is so exciting. .And yet it is an overlooked area. As artists we often describe everything else but not brush control. I am so grateful for having lived in China, so lucky to have been taken under the wing of a gifted mentor and to be honest, delighted I can pass on this knowledge. Keeping tips is a selfish act. Passing them on helps others create beauty for to be enjoyed. 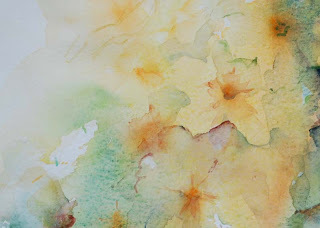 I feel like painting primroses now in a Chinese style, I wonder how they would turn out! 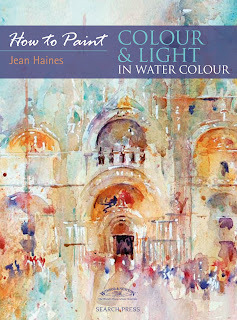 How to Paint Colour and Light in Watercolour is my first leap into being an author. For years following workshops and demonstrations so many artists and friends have encouraged me to share my technique. I have been literally eagerly pushed and begged into putting my way of working into a form where everyone can enjoy step by steps in a book including insights into how I think. To write really has been a dream of mine for some time and this year in 2010 each day brings me closer to seeing that dream coming true. My first book will be available officially from August of this year but can already be pre ordered via the publisher directly and Amazon.com. Yesterday yet another large brown package arrived with the post and my squeals of delight when I opened it should have been heard worldwide! Inside was the glossy proof of my unbound book.This stage is where as an artist I need to study the colour on every single painting to approve whether they perfectly match my original paintingst. Until now I have only seen the early proof on matt paper which was quite pale in colour. The images were just in place for the design lay out and nothing more. Being new as an author this concerned me as I have never gone through the creation process before. I was guided by my publishing team that the final proof would look very different and advised not to panic. The images didn't look like my paintings then. Now they do. And I have finally my book in loose page form but with the exact colours that you will see. If I said I was thrilled it would be an understatement. I look at several paintings as I leaf through the pages and ask myself if I really painted them. I know immediately I would buy this book.The strange thing is I can't wait to have it in my hands to read through and enjoy because I am not only sharing my techniques with others. I am teaching myself how to improve. 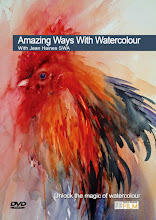 My own enthusiasm and energy along with my passion for watercolour sings on every page. I never saw this coming but it really is like being on one of my own workshops and I am so excited. I can see for the first time what others see when they attend my sessions. This sounds very strange but I want to come on one and enjoy the freedom of watching me in action. My book is the closest thing to this ever happening and I cannot wait for it to be released! Today I am loading my car with a collection of paintings to deliver to the Peter Hedley Gallery in Dorset. I was selected from the SWA,Society of Women Artists Annual Exhibition to take part in a show there last Autumn. During the exhibition my work sold so well that I was invited to become a gallery artist. Now I continue to return with new work on a regular basis. The painting " On the Beach" is one of my favourites from the show and sold immediately. 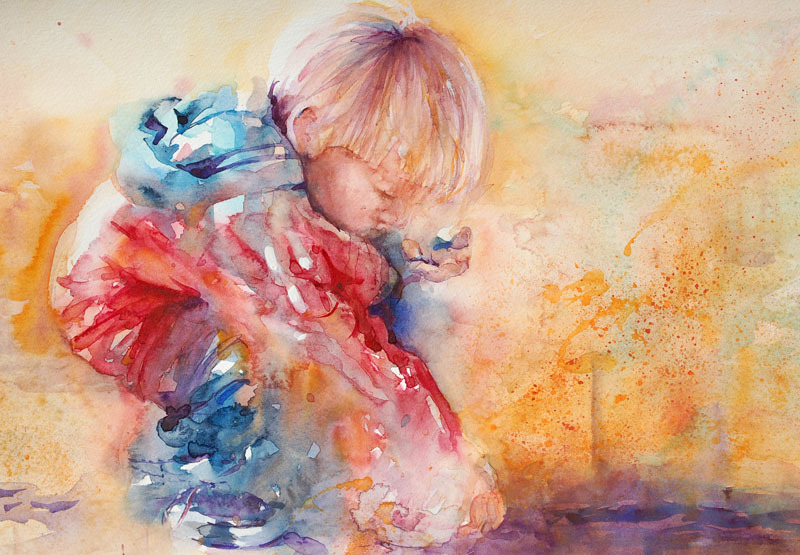 I became fascnated with how the light played on this childs arm so the whole painting evolved around that section. No preliminary sketch. Just colour guiding my brushmarks as always. I am often asked what is my best selling subject and I have to honestly answer I don't have one. Everything seems to sell. My cockerels are collected and expected in nearly every show. Flowers are always popular and animals seem to "walk off walls". I don't even think it is the subject that sells. I think it is the style. It is unique and fresh and is popular because no one knows what to expect next from me. To be very honest I don't either! If you are near Dorset ,UK do look into the Peter Hedley Gallery. They have some very fine artists including Victor Ambrus and Nicholas St. John Rosse. 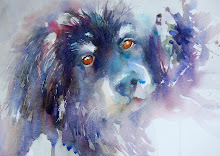 Early stage of an original watercolour by Jean Haines. It happens sometimes. Many artists will recognise the heavenly feeling of that magical moment when you just know a painting is right. From the very beginning it holds that special something and you are drawn to it like a moth to a flame. To me a successful painting is often where the artist has completely fallen in love with their subject long before they even pick up a brush. If the enthusiasm and excitement is there at this point magic will surely follow. I know Fred and I love Fred. As a subject he is purrfectly delightful and his character is quite amusing although he may think he has a somewhat regal air. There is no doubt about it. Whichever way you look at him, for a cat Fred is rather special! I have some gorgeous Winsor and Newton 300lbs Rough Surface watercolour paper. It was begging to be painted on. 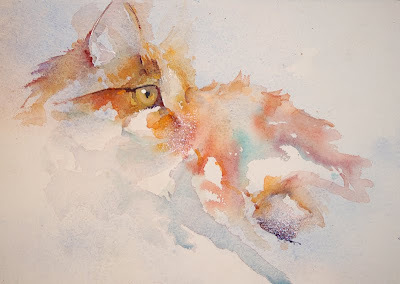 The surface felt wonderful as the texture was purrfect for painting fur. 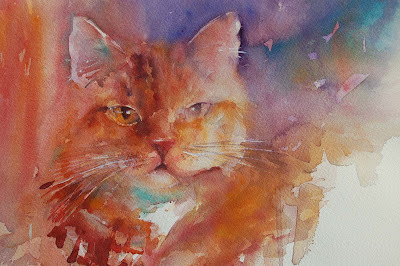 I started painting Fred by laying a soft wash of fresh clean pigment to depict the coloured sections of his fur. With my thumb I gently "stroked" the fur of the outline into the background. I often do this when I am working with animals to gain a sense of their being. I have fallen back to Chinese Mentors influence. She came from Shanghai and time I spent under her guidance in China has stood me in good stead for brushwork control. Patience for using each mark to tell a story. And the value of really thinking before you paint. While working I stopped and looked at the cat appearing from the wash in front of my eyes and that wonderful rush of excitement hit me. You know instinctively when something magical is about to happen. This was one of those moments. I am amazed at how many artists race to finish a painting when every single brushstroke is so enjoyable to witness in its own right. I take time to love every wash, every colour addition, every brush mark or water effect and I use them all to enhance the beauty in each painting I create. With my technique anything can happen at any moment. Every action counts towards the final destination. With no preliminary sketch to guide me I have to find and place every single feature accurately but in a way that creates and illusion of movement. To me this piece is the beginning of a wonderful journey and I am in no hurry for it to end. I know where I would like to go with the final result but I so want to enjoy getting there. This painting is sold so unavailable to purchase. Watching our cat Buster relax in front of the fire will now be a distant memory as the sun is shining more frequently with the Spring Weather. It is the beginning of an exciting new week. Many white pieces of paper are tempting me to continue in my journey in watercolour. A wonderful artist friend let me know recently how much they love seeing my blog. On days when they don't feel like painting they look here for inspiration and I was thrilled. In the same conversation they asked a question which comes up so much.
" Why do you share so much online, aren't you afraid of being copied? " I thought about the question and came to this conclusion. We could all waste so much time worrying about what someone else is doing or we can live our own lives to the full instead. I am reminded of a little old lady who lived in our Welsh village where I grew up. She was well known as the village gossip. Villagers would hastily turn around or cross the road when they saw her coming. Every now and then she would knock on our door and be invited in for a cup of tea. This is where as a child I would hastily disappear. I knew if I was seen and called into the room I would need to sit politely and listen to the conversation. I also knew I would be very bored so found ways to better use my time. "Firelight" section of colours fading away from the subject. What makes me laugh as I type this is that I obviously haven't changed. I will still vanish if an unkind word is spoken. And there are always better things to do. As a teenager I couldn't help but ask why my guardian was so kind in listening to this elderly lady regularly tell tales. Her reply has stayed with me all these years.
" Because if I listened it saved someone elses ears and besides, I won't pass a word on." "Firelight" Close up of Mouth section. In all the days I knew her she was an incredible person. 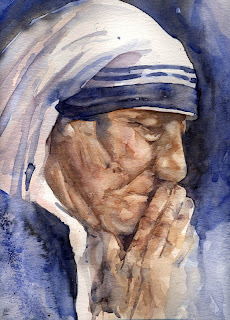 Only good was spoken and she was a shining if not impossible example of a human being to follow! But she did often quietly mention she regretted the time she had wasted instead of being allowed to carry on with her day. 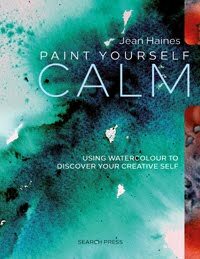 When we paint we know if we are painting our own creations. What others do really is on their conscience and it shouldn't stop us sharing, giving or being part of this wonderful world of art where so many artists daily shine in their own styles. The journey to finding your own technique is not an easy one. I hope I help many find their path and also help other artists reach their destination in their own journeys. What a gift that would be . 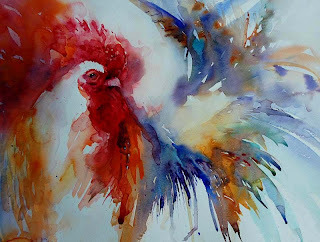 "Glorious Call" Original Watercolour by Jean Haines. I have so many exhibitions coming up at the same time and at the moment the decision is what should be displayed where . I have so many favourites to choose from because I paint from my heart and not with an aim to deliberately sell a piece. Some I definitely deliberately paint to keep. When you are aiming to hang your own art on your own walls you start to see it very differently . You imagine just why you would like to enjoy it for years to come. It has to mean something to you. Each new day I fall in love with a subject and thoroughly enjoy working on it. My creative soul isn't restricted to any particular theme. I don't ever need to remain painting just one thing such as flowers, animals, people or landscapes. I paint everything in sight. That is the true pleasure of my style as I could paint absolutely anything with this technique. The method lends itself to seeing colour and the patterns they form. When I place all these shapes together in watercolour layers an image will form and gradually the essence of my subject appears as I work. And even if I wanted to I couldn't get exactly the same result twice. Each piece is unique. 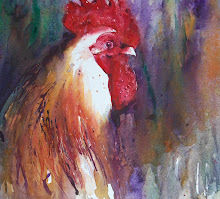 From my Autumn 2009 collection a cockerel " Showing Off" was displayed in the "Hampshire Life" magazine to promote my exhibition at the Market Street Gallery in Alton. Once framed the original piece always sang to me as a very special painting. Everyone who saw it in the show loved it so much. It caught the eye and sang to viewers. It made you feel so alive to look at it. It cheered the soul. Certain paintings have something about them and it is magical when that happens. A quality that cannot be defined. A collector loved the piece so it has gone to a very special home in Turkey. I miss it and my mind kept thinking about this particular painting. So I have tried to recapture the feeling for my own cottage. The collector and I may be linked forever via this watercolour and that too is a wonderful thought because they are a very special person. Art really is a magical circle that can unite the world in so many ways. Many friends have been asking me how Taffy our Bearded Collie is following his recent surgery. It really has been an emotional ride but happily Taffy is doing really well after the scareof almost losing him last week. 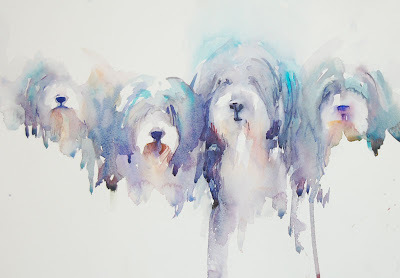 I have updated my Bearded Collie Blog so if anyone is interested news about what was wrong is there in more detail via this link. First in a series of Tributes which I hope will bring smiles to all who not only read these blog entries but star in them also. The one fact I am sure of in life is that it isn't about us. It isn't about what we want nor is it only about what we want to achieve. It is about others. People around us on a daily basis who touch our hearts in some way or whose hearts we touch. I meet so many fascinating people on a daily basis and I know I am so lucky to do so. My world is full of incredible friends from all over the world who mean so much to me as I to them. We give, share and stay in touch. Little things mean more than the big things and our value in life is a priority in quality in all we do. And I am going to embarass one of my wonderful friends who I only know from meeting online a few years ago. I first met Kaye when I ran a watercolour site which wasn't a brilliant idea on my part. As much as I loved sharing and teaching there I had no technical skills to manage the site. It also took far too much of my creative time. But Kaye and other lovely members stayed in touch and I recognised in her all that time ago something so very special. She has more than talent. Her warm personality shines and I suppose this is why we connected so strongly. Over time Kaye has quietly turned to me for advise and I have watched as she has grown so much that she is flying in her own right but not simply by painting. Kaye is shining because of her heart and what she does with it. Kaye recently staged an exhibition for Help the Heroes and this morning I now hear she is helping Great Ormond Street with a painting too. You can find her wonderful art on this link to her web site. What I suggest is you notice the softness in her style? They say our personalities show in our approach to painting. I am relaxed and happy, my aim always is to allow others around me to be happy too. In all of Kayes paintings I see this quality. The quality of loving and being loved. At the beginning of this blog I mentioned life isn't always about us, it is about others...Kaye knows this so well and is a wonderful example or reaching out via our art. "Hints of Snowdrops in Morning Light"
This snowdrop painting was from a recent demonstration at my watercolour workshops at the Market Street Gallery in Alton. I started the day with a very simple one colour wash then turned it into something far more exciting with the use of more vibrantly warm colours which completely changed the mood of this scene. Even though it isn't complete a cold miserable Winters day has turned into one where the sun shone and created a ray of light. How magical is that? While I demosntrate or hold workshops I am often asked so many questions that are not related to painting. How did I start painting? , how did I get into selling?, how did I get into a gallery?, how do I price my work?, how do I choose which exhibitions to submit for?, how do I know when a painting is finished? How did I get into writing?. And so many more. I realise not everyone wants advise on how to use the brush or inspiration to paint. So I will add some entries on the answers to these questions to help as much as I can. And I promise as time allows I will try to alleviate some of the scary issues regarding being an artist. Many people seem to want to know what goes on behind the scenes of being a professional artist so I will share that too! 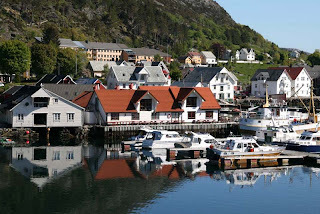 I have been invited to hold watercolour workshops in Norway in August of this year. I am really looking forward to going to this wonderful country for the first time. I was so surprised to discover that flights and accomodation are really reasonable from as little as £30-£50 per night including breakfast. I will be adding full details soon so if you are free for the first or second week in August and would like to come on a wonderful course surrounded by amazing views please contact me directly. I will be adding a link to the summer school soon. Places are limited so please book early for this very rare and inspirational opportunity. I have so many wonderful projects on the go at the moment. Many I feel so very lucky to be blessed with. Among them I am working on a series of scenes from old Dubai from when I lived there.These are all from photographs I have taken myself. My own resources which makes them more alive to my artists imagination.. 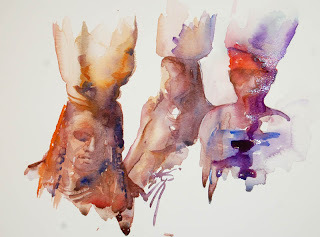 In comparison as subjects compared to the Himba Girls there is a huge difference in my results and sensations as I paint because I am aiming to capture something I have physically seen. I watched the gentleman walking in this market scene. I witnessed the sellers eagerly hoping each passer by would stop at their stall. I understood the need to stand in the shadows of the awnings as the heat became so intense. As a sun lover I too sought the shade. 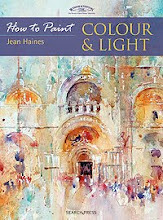 My book explains how I see colour and how it is effected by light. It plays a large part of my style. More Dubai scenes will be following soon and news of why. For now my trip down memory lane is so enjoyable I will go there via my paintbrush and think of amazing friends and artists I have met there and will meet again. My fascination with Tom Angs Himba girls is still very much with me. I am looking forward to the day when I know it is time to start the full painting on a large fresh piece of white paper. For now my studies are growing as is my information on what was happening the day these girls walked together. All thanks to my communication with Tom. As I was not there when he took this image I can't possibly know what was happening and as the story unfolds my painting will change greatly in the next piece. Inspired from the original photograph taken by professional photograher and well known author Tom Ang. When I shared the first Himba Girls study I posted a blog entry on copyright and theft issues . Since then I have recieved wonderful emails from confused beginners new to the art world and from established professionals thanking me for bringing the topic up. It is an area we all avoid because it can lead to so many arguments on what is and what isn't right. For the beginner there is more to understand and I promised I would explain further on my blog. Please bear in mind you can seek advise on and offline but the basic rules regarding copying are as follows. 1) Original Art. If you paint from your own resources such as photograhs you have taken or from life, anything that is not influenced by others this work is orginal and yours to do whatever you wish with. You can sell the piece, exhibit or use it in magazines. It is yours and you own the copyright. 2) Inspiration You may have purchased an instruction art book and wish to follow the step by steps.Perhaps you have been to workshop. The artists who write including myself expect to be copied for learning purposes only.We teach workshops and demonstrate so that others can share our passion. But to sell these copies is an infringement of copyright law. 3) Copying with intent to sell is a criminal offence. So if anyone is looking for an easy way to make a sale by using another artists work then they could be walking into an area where not only their reputation could be affected.Their bank balance could also. 4) Making Changes Without Permission This area I did not fully understand until recently but if you change an artists original without gaining their permission you are also infringing copyright. For example if you paint the same scene but add another detail or change the colour slightly you are still copying and breaking the law. It isn't worth taking the risk when there is so much that is so beautiful to paint. Be original! I have had many questions regarding workshops and books. Let's use an example. In the case of my copied rose painting which I mentioned in my previous post. I had discussed what colours I used, where I would start and painted the whole composition fully describing my technique and brushstrokes. The copying artist then returned home and painted an almost exact painting. There is no confusion.The copying artist knows they watched me paint the roses and they know the compositions are identical. Legally there is an issue here that a solicitor could deal with. This is where any artist who has been copied has to make a decision. To take action or not. However if you do as I mentioned before quite often yes,you are seen as the guilty party. I fully sympathise with the professional artists who feel as though they should almost apologise to the copying artist for asking them to remove the copy. But people do sometimes make genuine mistakes if they don't understand the law. In less serious matters simple and kind communication is all that should be needed to solve the issue,on both sides where both parties need to respect the others feelings. Unfortunately those who deliberately continually copy to sell often do know exactly what they are doing and this makes the whole situation even harder harder for beginners as they are misguided unfairly. So to close when you paint ask yourself a question which only you can answer. 1 ) Is it really mine ? Can I honestly say this is my own work or should I say it is inspired by another artist. 2) Should I contact the original artist? If your painting is inspired by another artist contact them and explain why you would like to share your painting. You will be surprised at how delighted the artist could be to hear from you. But this is only step one. 3) What should I tell them? Be honest! Don't just ask if you can paint it. Let them know you intend to sell your copy too. 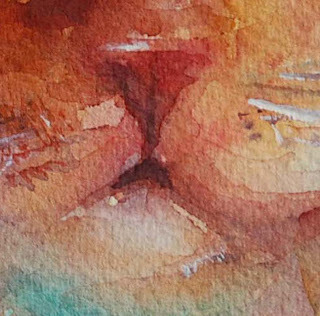 Tell the artist exactly what you wish to do with the painting. You may need to share the profits from the sale so be warned. There is another way of dealing with copies that both sides could agree on. Contact the artist and suggest you donate all proceeds from the copied painting to charity and add Inspired By with the original artists name. That could be a solution that does the most good! So if you are copying or feeling inspired get in touch with the original artist and wait until they reply before you risk breaking the law! Please respect their decision, if they have the original on sale they may reject your request but it is always worth following the copyright laws.Your name and reputation is seriously at stake. Himba Girls Study II inspired by a photograph by Tom Ang. 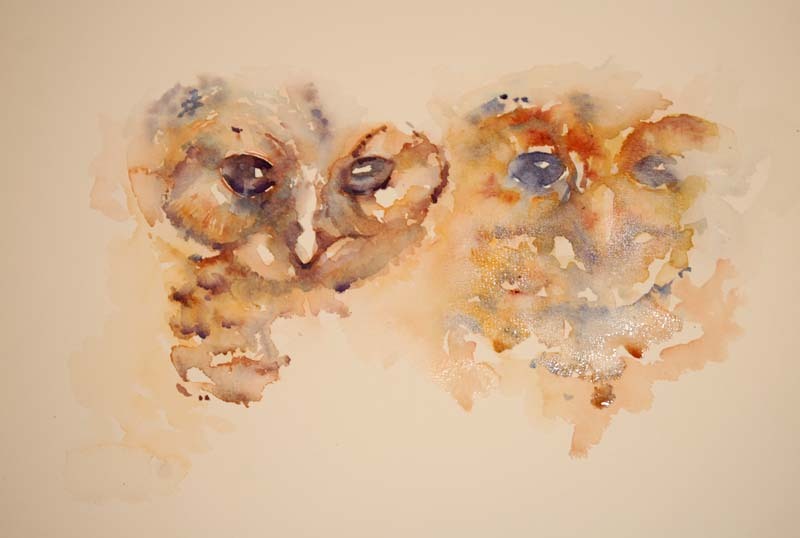 I delivered two new paintings of owls to the Market Street Gallery this morning and I am delighted to discover my Spring Exhibition is being extended due to its popularity. Although pieces have now been removed due to sales there is still a selection of work on view covering a variety of subjects. 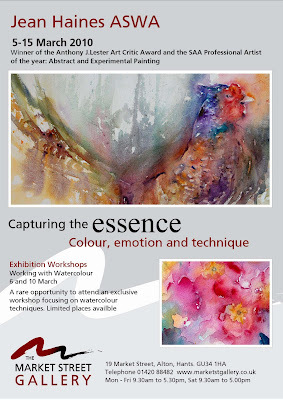 For full details on when the exhibition will close please contact the gallery directly. If you study the portrait above you may think this was a deliberate decision by an artist to paint a face. But the story behind the painting is a special moment in my demonstrating life. 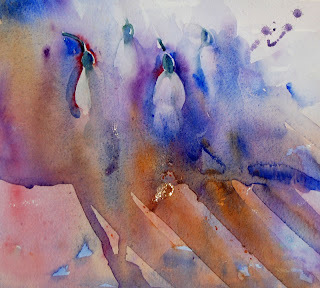 I had a group of students on one particular workshop and I had chosen to demonstrate a wash. I covered a large piece of paper with a mixture of shades which were mainly yellow and orange dropping blue into several places which merged with the existing wash. At this stage it was already looking really fascinating. I could see a face. Even though I had no intention of completing the wash my brush felt compelled to continue. The class became very quiet behind me as this incredible painting took place. I took the profile outline to where flesh tones were evident and then the class could more easily also see a face appearing. The features were already defined in the original wash so at this stage I simply allowed the painting to paint itself. 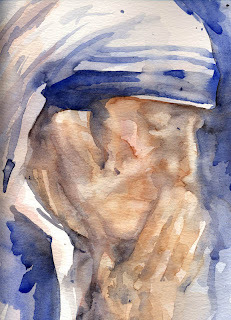 The flesh colour running from the face to the lower section of the paper gave the impression of hands in prayer. Watermarks gave a clear impression this was not a young face so I allowed them to remain and slightly strengthened them. The class fell silent yet again as finally a vision appeared from nothing more than a blank piece of white paper. To the left of this face on the far right section I decided to allow the initial yellow wash to stay untouched merging with the blue.This was to remind myself and the class how this portrait began. But within this section was a light unique watermark in the upper corner .This shone down on the freshly painted portrait. The class felt it looked like an angel and I agree. When we demonstrate we often surprise ourselves with our results. But for me on this day I feel as though my hand was guided. As odd as it may sound I feel my brush was moved from another source and I merely held it. I also do believe that miracles can happen and we are not always aware when they occur. I have never sold this painting. I know in my heart it will at some point go somewhere that it will be wanted and enjoyed. But it will not be seen until I am ready to let it go. And it will be given as a gift at the right time to the right new home because we cannot sell or put a price on miracles. And I find giving is the greatest gift of all in life especially when it can help others. From an " Africa" exhibition at the Bronze Gallery in Hampshire in 2009. Working through my subjects today I looked back at last years work and the year before that. Figures have always been a favourite attraction for my brush. 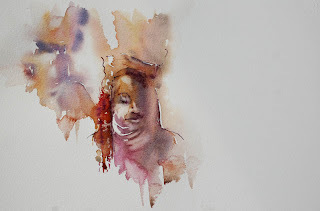 I enjoy incorporating them into my watercolours and have done ever since living in Dubai where the colours seemed so dramatic. The " Himba Girls" studies are bringing back wonderful memories. All from looking at a simple photograph so much is happening that is affecting my new work. My daily studio routine is always a warm up exercise first usually aimed at the bin before I start painting my collections.The strange thing is these exercises often rarely reach the bin. Yesterday I mentioned how I fell in love with a wonderful photograph taken by the amazing Tom Ang. Having gained permission to paint this scene I am now playing with a selection of ideas for colour and composition. I have to bear in mind I was not there at the time Tom took the original image. I cannot see what he saw other than through his lens. As an artist I can create my own interpretation but there is something undefinable about Toms capture that keeps drawing me back to look at his photograph. In a few minutes I have created the above small study to gain an insight into how the disntant figures can interact with a main girl in the foreground. There is absolutely no intention in this exercise to gain a likeness in features of faces. Just the sole purpose of playing with colour combinations and I am not quite there. But a magical creative process step by step is leading me to where I want to be with this particular journey. In my mind. I can see the finished piece now so clearly. A few more studies and I will be ready to enjoy painting the real large piece. For now a few more exercises to start my day will not only thrill me but keep my artists spirit highly enthusiastic and motivated to race to pick up my brush each day. I am very much in love with Toms capture. I wish to feel that same strong emotion in my own when it is complete. I am setting myself a challenge and I love that thought. Norway, Dubai,South Africa, USA and Asia.